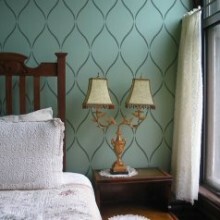 Our Vinyl Wall Pattern Decals are sold as individual decals and may be applied to any wall or window indoors or outdoors. Each decal must be hand spaced to fit your area to create a totally custom look. Use them on any wall or window in your home or office. Please select your color and package size (quantity) from the drop down menus. The larger the package size, the lower the cost per decal. All order are shipped next day. Click the button below to add the Vinyl Wall Patterns 21 to your wish list.